STEPHEN C. BEHRENDT, Professor of English at the University of Nebraska, has two books forthcoming in spring 1992: Reading William Blake (MacMillan, St. Martin’s Press) and a volume of poetry, Instruments of the Bones (MidList Press). DAVID V. ERDMAN is the editor of the Annual Romantic Movement Bibliography and Blake and His Bibles. With the assistance of David Worrall, he edited Childe Harold’s Pilgrimage: A Critical, Composite Edition (Garland, 1991). CHRISTOPHER HEPPNER is writing a book on Blake’s art. WALTER S. MINOT, Director of Writing across the Curriculum at Gannon University, works in both rhetoric and literature. His current research is on puns in romantic poetry. MORTON D. PALEY’s latest book is an annotated edition of copy E of Jerusalem, published for the William Blake Trust by the Tate Gallery. He is currently working on the subject of apocalypse and millennium in English romantic poetry. Cover: Anonymous, engraving for Thomas Burnet, The [Sacred] Theory of the Earth. Courtesy of the Royal Library, Stockholm. DENNIS M. READ is Associate Professor of English and Director of the Learning Resources Center at Denison University. He is the biographer of Blake’s antagonist, R. H. Cromek. DONALD H. REIMAN works at the Pforzheimer Collection, the New York Public Library, editing Shelley and his Circle (Harvard). He is also General Editor of The Bodleian Shelley Manuscripts and The Manuscripts of the Younger Romantics (Garland); some 30 volumes in these two series have appeared since 1985, of which Reiman’s sixth volume is The Harvard Shelley Poetic Manuscripts (1991). KAREN SHABETAI teaches English at the University of Washington and is at work on a book on ethics and the exemplar in romanticism. DAVID SIMPSON is Professor of English at the University of Colorado, Boulder. The author of various books and essays, he has just completed a manuscript titled Romanticism, Nationalism and the Revolt Against Theory. 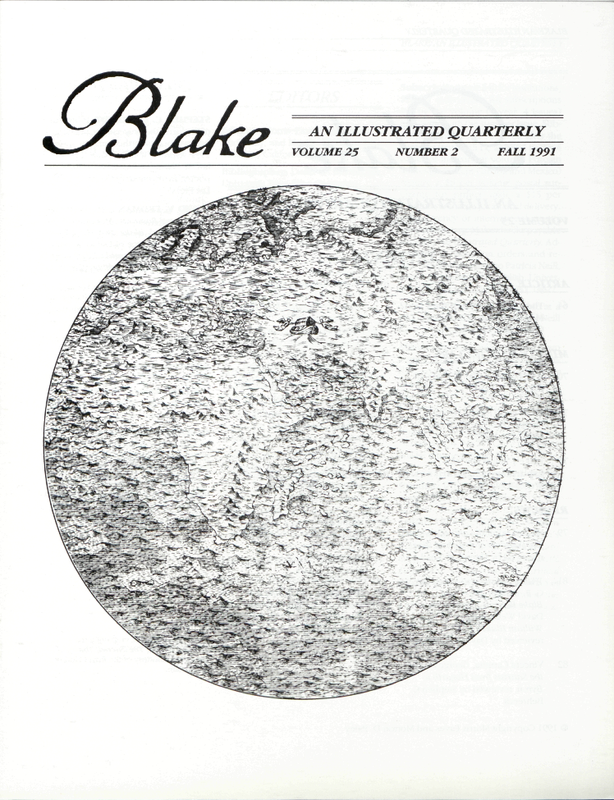 MICHAEL J. TOLLEY has been pushing his own barrow on “The Tyger” since the second issue of the Blake Newsletter(1967). He has made a particular study of Blake’s use of the Bible. JULES VAN LIESHOUT (University of Iowa) is finishing a dissertation on Blake’s Eternity in the light of dialogism and chaos theory.